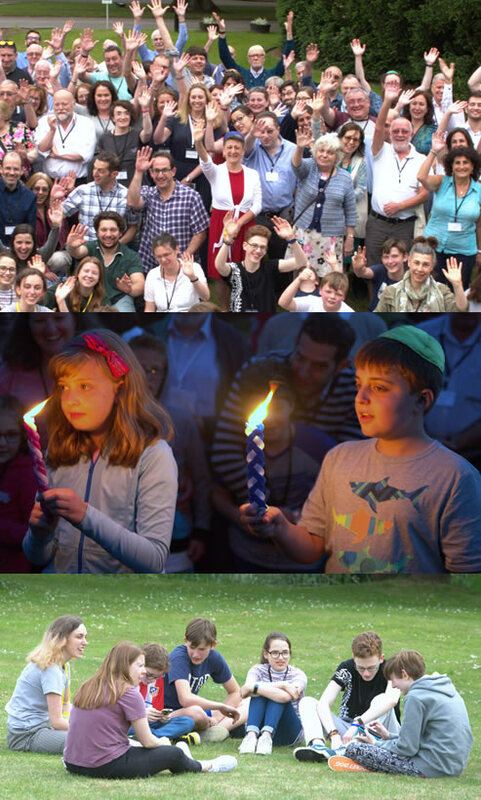 “I am proud that Reform Judaism is leading the way in talking about matters of life and death, mental health and loneliness and long-term financial sustainability of communities and I cherish the vibrancy that this conference represents”. Rabbi Laura Janner-Klausner in her sermon given at Chagigah, Reform Judaism’s biennial celebration weekend. Over 200 people attended the event which took place from 22-24 June at Eastwood Hall near Nottingham. Chagigah means celebration and this reflects the special atmosphere of the weekend. The programming reflected a strong emphasis on responding to the needs of communities and developing leadership. Reform Judaism’s 41 communities made significant commitments on mental wellbeing, financial sustainability and the environment. A new initiative focussing on synagogue finances was launched and endorsed with a vote from delegates. ‘Money for Values- Re-thinking Synagogues’ Finance’ is designed to help synagogues consider new models of financial stability looking at membership models, fundraising and budgeting that reflect the priorities and values of the community. Rabbi Mark Goldsmith of Alyth said: “This initiative is all about understanding that our members are giving to a Judaism that brings them meaning. It is about fostering relationships with synagogue members that help them to feel that their membership commitments are appreciated and encourage them to support their synagogues to be ambitious for Jewish life. Much of this feels obvious but it’s way too common for synagogues to become transactional”. Martin Dives, Chair of Shir Hayim Reform Jewish Community in Hampstead added: “The initiative is a very well designed programme to address the most urgent and important challenges of our communities. Full of relevant and useful information and recommendations, it should be an essential next step for all synagogue leaders to participate in”. Entering the next phase of the Communities that Care initiative launched at Chagigah 2016, Reform Judaism committed to adopting the NHS’s recommended five steps to mental well-being. During the next two years, Reform congregations have committed to making communities safe, welcoming and open to all people with mental well-being problems and to partnering the Reform Movement on the journey to being a mental well-being friendly movement using the NHS’s recommended steps. Rabbi Miriam Berger of Finchley Reform Synagogue said: “Personal testimonies set the agenda for our weekend of exploring the challenges of mental health in our communities and how to create synagogues which promote mental wellbeing among our members. The scale of issues among our teenagers, adults and the elderly is no different in our communities than the national statistics state so we have to rally our communities to grapple with this and act now. We voted unanimously to promote the NHS 5 Steps to wellbeing, putting mental health firmly on the agenda for our shuls”. Brenda Dinsdale of Newcastle Reform Synagogue added: “It was a moving experience and great honour to be able to share with other people the brutally honest stories of their lives and experiences and in doing so develop a model for future working”. Inspired by moves to cut down on single use plastics following David Attenborough’s Blue Planet II programme and to set an example of environmental responsibility, communities voted to make a stand on reducing single use plastic containers. The target is to cut single use plastic by 50% by Rosh Hashanah 2018 and 90% by Rosh Hashanah 2019. Reform Judaism’s key initiatives are crafted by rabbis, Reform Judaism professionals, community welfare, education and development professionals and lay people in collaborative partnerships. In his speech to the closing session of Chagigah, Reform Judaism Chair Geoffrey Marx noted that “Reform Judaism is making an enormous difference to our communities, delivering invaluable partnerships and laying the foundations for a bright future. Sustaining, strengthening and successful, we should all be hugely proud of our Reform Judaism”. In addition there were sessions on Jewish learning and education in communities, music, theatre, arts and crafts as well as inspirational Shabbat services and social events. Emily Carp from Menorah Synagogue in South Manchester summed up the weekend saying: “ I had a great time at Chagigah and it is always lovely to get to meet old friends and make new ones, to experience different Shabbat services and to learn from so many different people, communities and experiences”.